The two typical transmissions that are available in automobiles are manual and automatic. There are variations to each kind of transmission but the mechanics are the same. The functions for both categories are also same but the difference is in the functionality of each. What is Shift Lock Release? The manual transmission requires the driver to shift gears manually using a clutch and a gear shift. The gear shift can either be floor shift or even mounted next to the steering wheel itself which was most common in the older automobiles. The number of gears depends on the engine size and the overall size of the automobile. Sports cars and large utility vehicles tend to have more gears than normal sedans. However, no matter what the number of gears, the driver has to shift gears manually by pressing the clutch and shifting the lever into the required gear. The automatic transmission does not have a clutch and does not require the driver to shift gears manually. The gear shift is different as well. It does not have the “H” looking pattern of a manual transmission. Automatic transmissions generally have a vertically descending gear shift which allows the driver to switch between options like park, reverse, neutral etc. As far as the driving gear is concerned, the automobile transmission is designed to switch between those automatically by adjusting itself to the motion of the car. In order for the driver to switch between the options available in the automatic transmission, there is a shift lock release option. The shift lock release is generally a button that is built onto the lever. It allows the driver to lock the gear lever into a particular option. For example, when the driver parks the car, he/she can switch the lever into the parking option and lock it there. The lever cannot be moved until the shift lock is released. How to use Shift Lock Release? The shift lock is typically a button on top or on the side of the lever. If the button is pressed the lock is released and the driver can switch the lever between the options on the transmission. When the button is released the lever gets locked. The shift lock release allows the driver to switch the lever and lock it back in the position they want. The shift lock release is generally connected to the brake pedal. Once the driver presses the pedal, the shift lock circuit becomes active otherwise the circuit remains closed. This is also a useful measure taken by manufacturers because this makes driving safer. 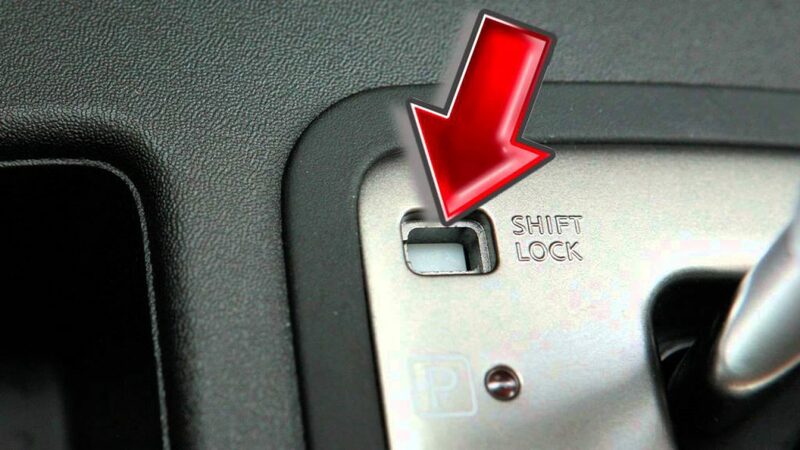 The shift lock allows the driver the safety of driving in a particular motion, for example forward, but will not allow the driver to switch to reverse while driving. If this happens, the whole transmission can get blown. The other safety is through the brake connection. Unless the car comes to a stop it will not allow the driver to switch the lever. How to use the shift lock release option is also stated in the owner’s manual of the automobile. For automatic transmissions, the shift lock release option is a measure taken by manufacturers to protect the transmission as it is being automatically operated. For manual transmissions the control is already with the driver and that allows the driver to control the gear shift according to their preference. This is not the case in automatic transmissions and that is why such measure needs to be taken. Next Post: Why is Your Car Engine Stop Suddenly?